Garden visitors viewing a seedling and then its two parents sometimes ask, why did you cross those two? Assuming that the hybridizer has goals, he/she should be able to answer that question. Just for fun, I'm going to post some seedlings, then discuss either (1) why I crossed the parents or (2) what plans I have for the seedlings in the future. 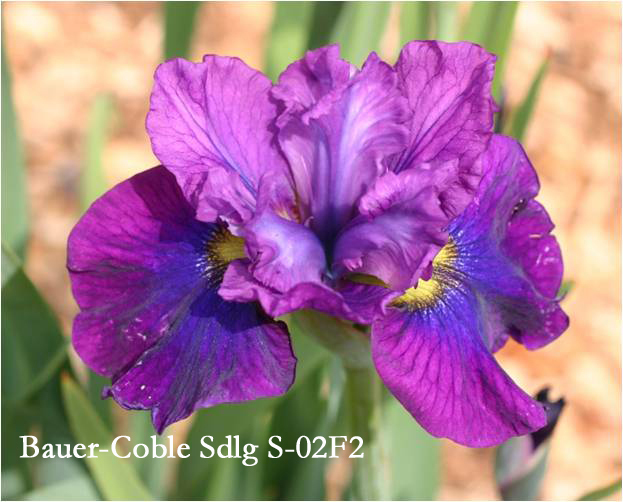 The first pair are Sdlg 05I1, a plant that took "best seedling" at the Fredericksburg Area Iris Society's spring show last year, and Keith Keppel's 'Fiery Temper'. Why make the cross? Well, even though I really like 05I1, I could wish its falls were a bit broader. 'Fiery Temper' has broader falls. 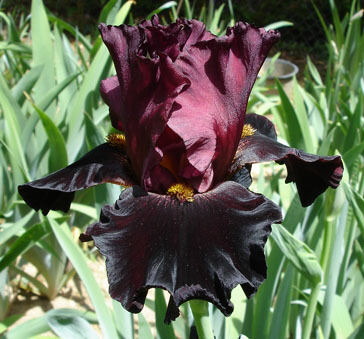 It's also a bicolor, which I felt would work with 05I1 being an amoena (I prefer bicolors, neglectas, variegatas and amoenas over solids), and its red-orange beard was a plus. I wanted to keep 05I1's good branching, so made it the pod parent. were very similar not only in coloration, but in height and, most importantly, in the slenderness and shape of their branching and their proportionately small blossoms. I thought the two of them might produce a colorful, slender, well-branched offspring. In fact, the cross produced several such seedlings, more than one of which will be introduced. 07U8, below, took "best seedling" at the Fredericksburg Area Iris Society's spring show a couple of years ago, and may be introduced yet this year. It sports up to 12 buds on excellent branching. on Prince Igor Both of them have 'Romantic Evening' in their backgrounds. Nine of 49 seeds germinated and were planted out in 2009. I held the pots over, and 16 more germinated in 2010. None of the 2009 seedlings is remarkable, so far, and only two of the 16 planted in 2010 have bloomed, so far, which isn't unusual. The better of the two is 10A3, which didn't get the red beard or anything else to commend it other than good branching. So, I'll still be watching for the siblings that haven't yet bloomed. Don't we, as irisarians, know that "hope springs eternal"? Red-bearded 01J14, pictured above, was also crossed with 'Wearing Rubies'. whose falls are broader than they appear here -- which I have back-crossed to 'Wearing Rubies' and which surprised the heck out of me by reblooming this past fall! How about a velvety, blackish rebloomer with a red beard? Purple. Since ancient times it has been the color of royalty, due to the difficulty and labor involved in acquiring the materials for the dye. 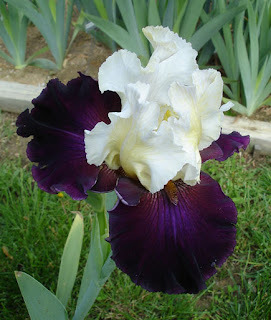 It is also the classic bearded iris color, and the one most often associated with the garden iris. Far from its traditional regal role, we are often bored with this color class because of it is so common in irises. 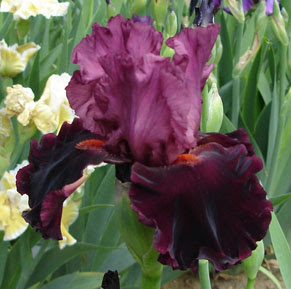 Hence we tend to overlook some really great varieties just because they are often seen and of this typical color. Such a one is the classic French variety 'Monsignor', from Vilmorin, introduced in 1907. A bit of a closer look and we can dispel this perception. There is nothing common or ordinary about 'Monsignor'. 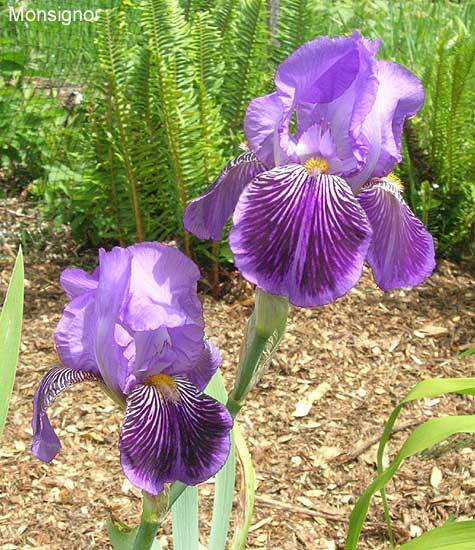 An excellent variety, with a special affinity for mass plantings, the soft violet with the deeper veining is really dramatic and makes a beautiful mass of color in the garden. 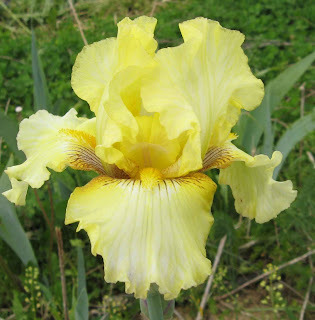 This is listed as an Intermediate Bearded (IB) iris, and is usually around 25 to 30 inches in my garden, but, in my opinion, is more of a Border Bearded (BB) in its presence and use in the perennial border. "Color effect almost a deep violet self. S. hortense violet, shading darker. F. velvety raisin purple to mulberry purple, veined the same to cotinga purple on the outer haft. The edge of the blade is blended lighter. The beard is dense and conspicuously orange tipped. The growth is vigorous, the foliage lax, slender, and yellow-green, and the flowering stalks freely produced. The heavy flowers are borne in compact heads on stiff stems, and make a good mass of color." 'Monsignor' is a fantastic garden plant in every sense. 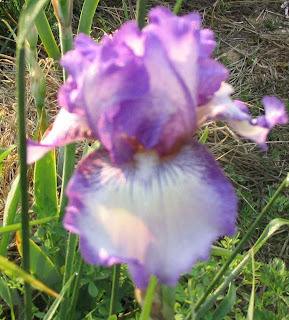 It grows beautifully, blooms reliably, is disease resistant and is hardy everywhere. 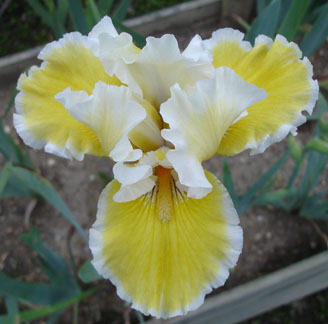 Anyone who enjoys the charm of the old fashioned iris form will enjoy having this beautiful variety in their collection. It is clothed in the color of kings. Use it to bring a little classic French sophistication, and a long history of French charm, into your flower garden. Once in a while an iris variety comes along with such an unusual aspect that folks just don't know what to make of it it. When consensus settles on 'intriguing' you know you have found one you're liable to either love or hate - no middle ground here. 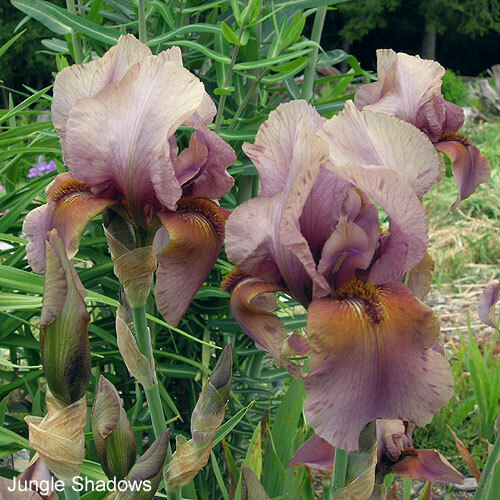 Such is the case with the ever popular 'Jungle Shadows'. One of the very last introductions to bear the name Sass, it was posthumously introduced by Helen Graham. From Melrose Gardens catalog for 1967: "Knowlton Award 1962. 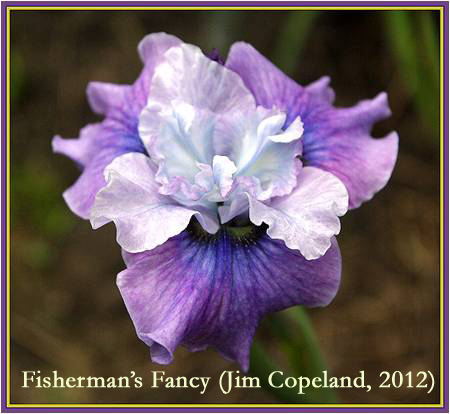 Strangest of iris colors play subtly in this unique little critter. 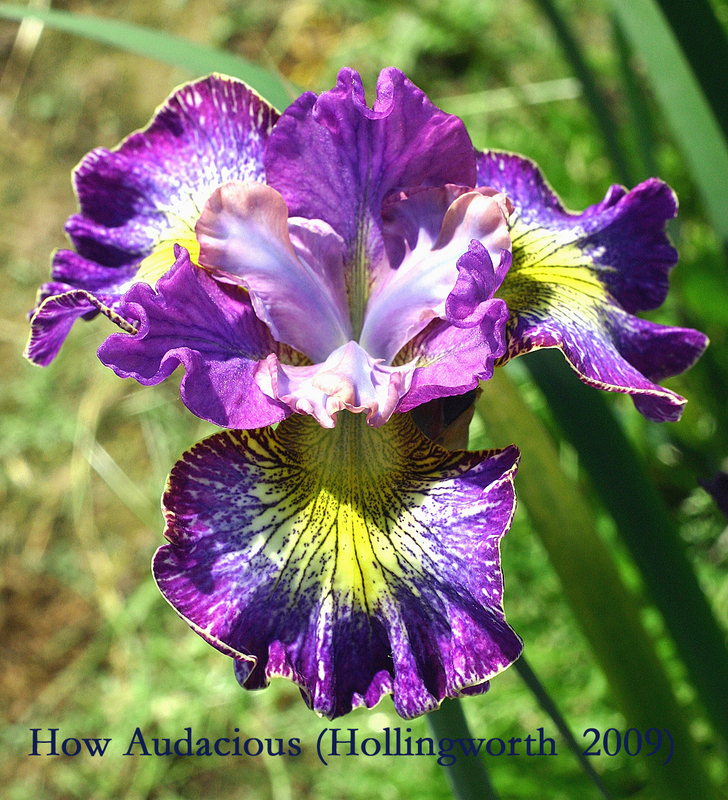 Dusky grey with over-blending of lavender purple and brown lightening toward the edge. Dark brown purple beard." 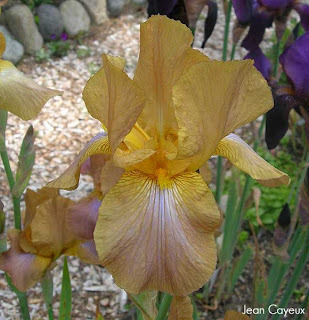 From Fleur de Lis Gardens catalog for 1965: "An odd blend of grey, with a flush of bluish purple and bamboo yellow which gives the flower a grey-olive color. Made further intriguing by a dark beard and violet-tinged hafts." 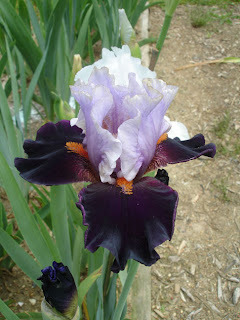 Classed as a BB (Border Bearded) this variety reaches about 24 inches in my garden. It is an excellent grower and reliable bloomer too. The color tones of the blossoms are particularly lovely in partial shade. It is not very often that a variety of such distinction as 'Jungle Shadows' comes along. Not only is its flower a garden asset, its foliage has beautiful PBF giving a longer season of interest in the border. 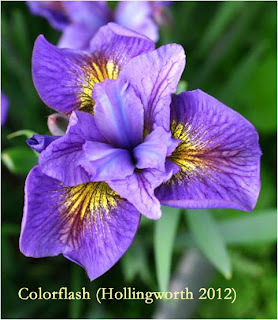 A classic iris for the gardener that desires the subtle over the flashy, quality over the flash in the pan. This has been an enjoyably mild winter for the northern tier of states so far, but, as winter oh so slowly releases its grip, the days are still short, and here in Michigan there is still plenty of time for snow, ice and freezing weather with only basketball and plant catalogs to keep us sane. So let’s close our eyes and imagine the scene four months from now. 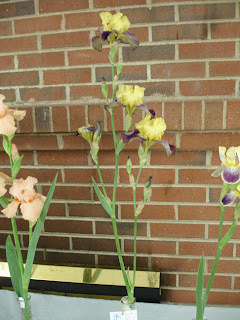 The days of June 7-9th, we know will be warm, sunny ones, and of course the irises will be in boisterous bloom. As many of you may know, those are the dates of the Siberian and Species Convention – arriving on schedule every third year. This year it returns to southern Michigan, the location of the first of these events in 1993. Since the Convention is being hosted in Lansing, the capital city of Michigan, we have called it A Capital Idea. The greater Lansing area is the home to the state government, a couple of very modern (and thankfully, quite busy) General Motors plants, and Michigan State University. None of these are on our tour. What will be on tour are four gardens (five if you count our own two locations separately). Two are in the Lansing area and two are near Kalamazoo, about 90 minutes away. 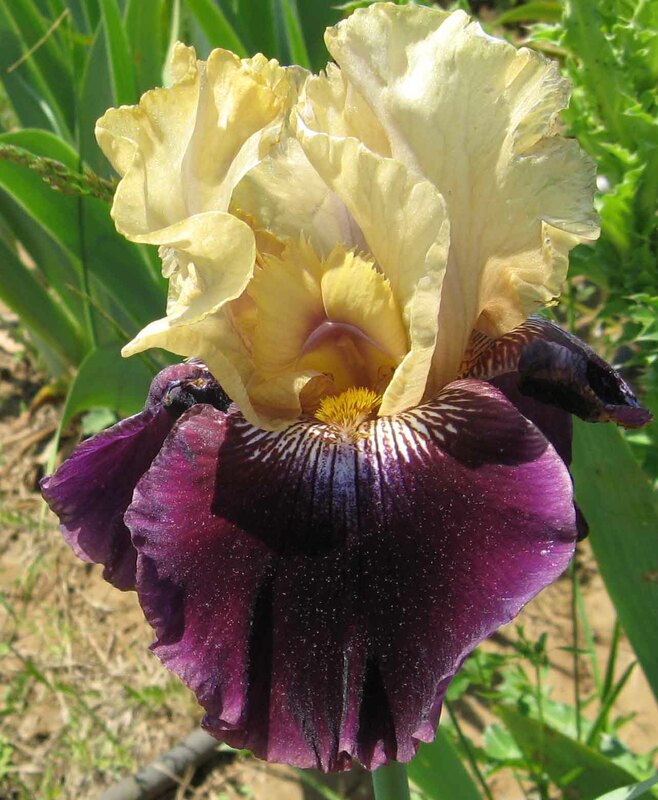 In Lansing you will visit our garden(s) (Bob and Judy Hollingworth) – we have the guests in one place and seedlings and Siberian display beds in another nearby - and John and Jean Kaufmanns’ garden. 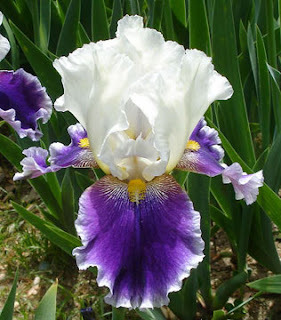 The Kaufmanns are fairly new to the national iris scene but it is not beginner’s luck that they have grown the guests better than any other place I can remember. John is by profession an agronomist and herbicide specialist and he took growing the iris guests as a challenge to his professional abilities. 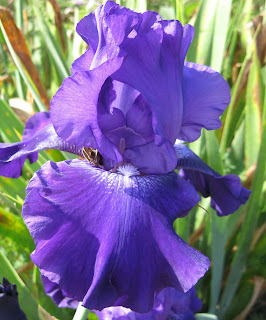 He also has been running trials of newer herbicides with the intention of finding ones that are safe to use on irises. This work was funded by the AIS Foundation and John will be giving a tour of the plots and reviewing the results as part of the tour. The two gardens near Kalamazoo are probably familiar to many readers, particularly from past Japanese iris conventions. Bob Bauer and John Coble at Ensata Gardens indeed need no introduction. 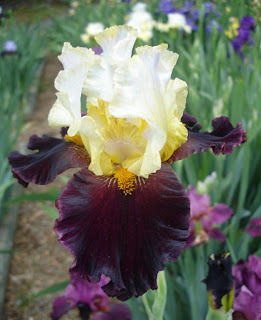 Lots of iris interest there of course, and a large Victorian house that they have restored to museum quality standards. Jim and Jill Copeland with hybridizing projects in Species, Siberians and Japanese are the final hosts. For many people, the excellent gardens aside, the lasting memory of a visit here is Jim’s Famous Fish Fry. This is Jim’s excuse to indulge his first passion, fishing, and once again you can be sure he will have caught his limit of walleye and we shall all benefit at lunch. So much for the stages for this performance, but who will be the stars? That’s not so easy to say. We have well over 150 different guests – mostly Siberians but also some interesting species crosses – laevigatas, and x typhifolia, pseudacorus, versicolor and virginica crosses. Here are a few photos to tempt you to come, but they aren’t meant to predict the front runners. More to come in the next blog. 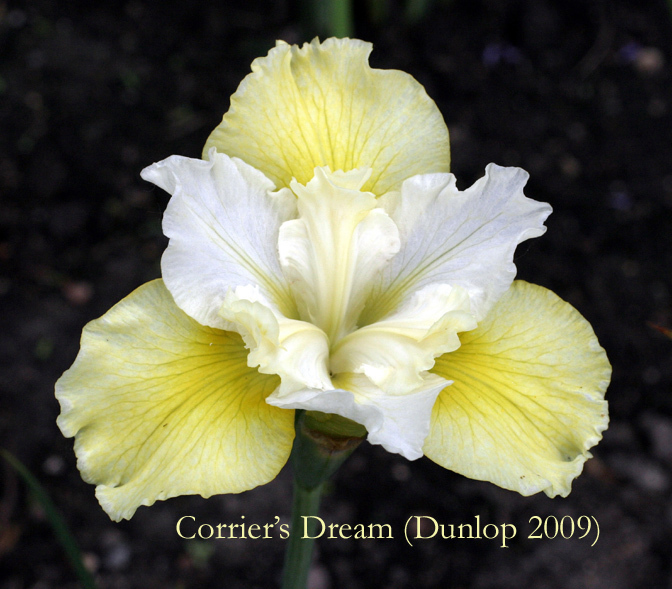 On view, there are many newer colors, forms and patterns from virtually all the US hybridizers and a scattering from overseas, as well as advances in more traditional form and colors. So, here’s a formal invitation to join us for the weekend. 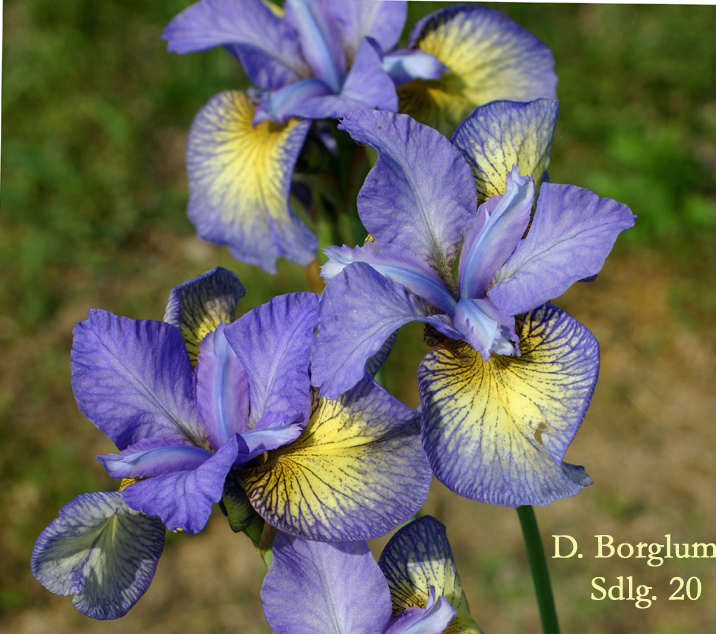 To find a registration form you can go to the website of the Society for Siberian Irises, or look inside the coming Spring issue of The Siberian Iris, or contact Deb Diget, the convention registrar. We hope you will indeed think this would be a capital idea. 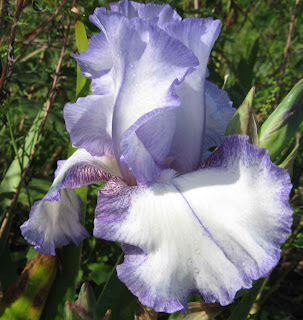 For anybody new to The American Iris Society, here's something I personally look forward to every year: the 2011 Tall Bearded Iris Symposium -- 100 Most Popular Tall Bearded Irises. The symposium is an annual popularity poll of Tall Bearded (TB) iris conducted by the American Iris Society (AIS). All AIS members may vote in this symposium. 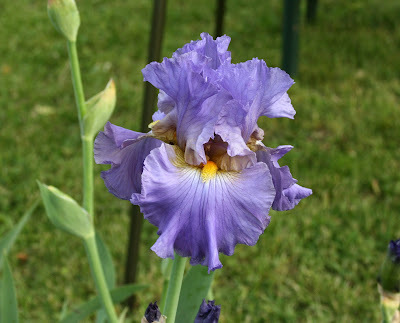 The top 100 Tall Bearded iris are then ranked and the results of the symposium each year are published in a PDF format and available via the AIS website at the end of January each year. All AIS members receive this quarterly publication as part of their AIS membership. More information about membership here. Stop by the AIS website to check the 2011 Tall Bearded Iris Symposium complete list (it will be available soon), and also check the AIS Encyclopedia's website where you can find the same top-100 list accompanied by full-color pictures of each iris. Who knows, you may actually have some of them in your garden? Have fun! 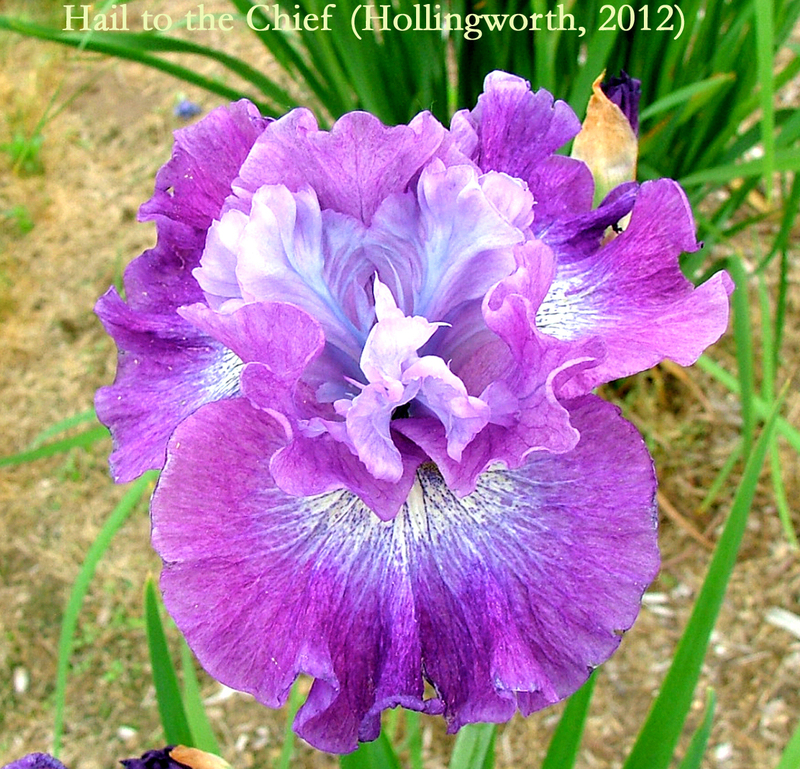 Note: The above pictures first appeared in January's issue of IRISES, the Bulletin of the American Iris Society. IRISES is a quarterly publication available to members of the AIS in print or digital formats. 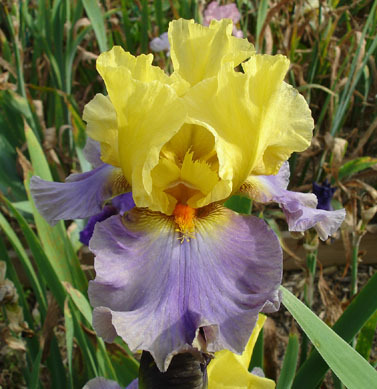 In an ideal situation, rebloomers are grown separate from the spring-only blooming irises. 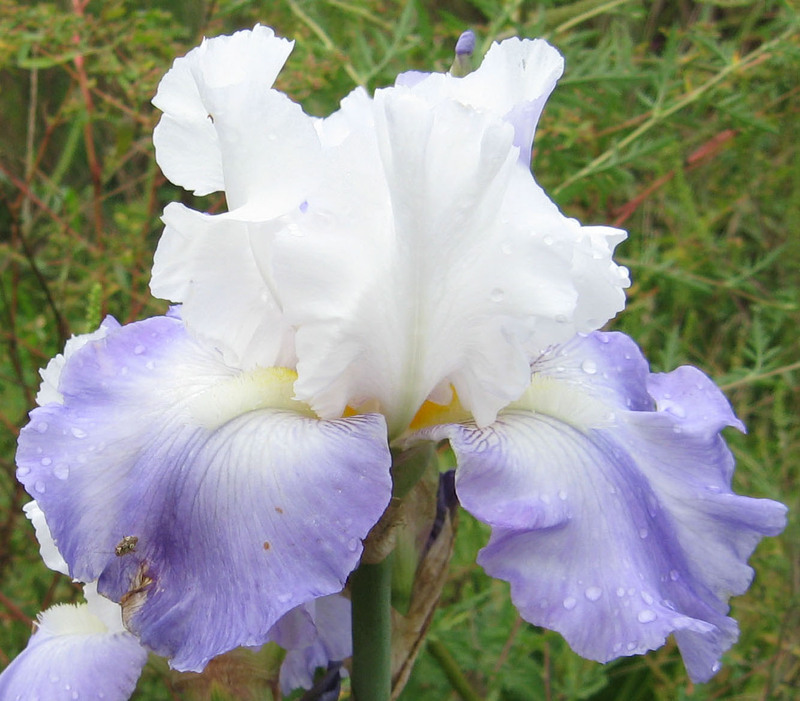 The two types of irises have different requirements. 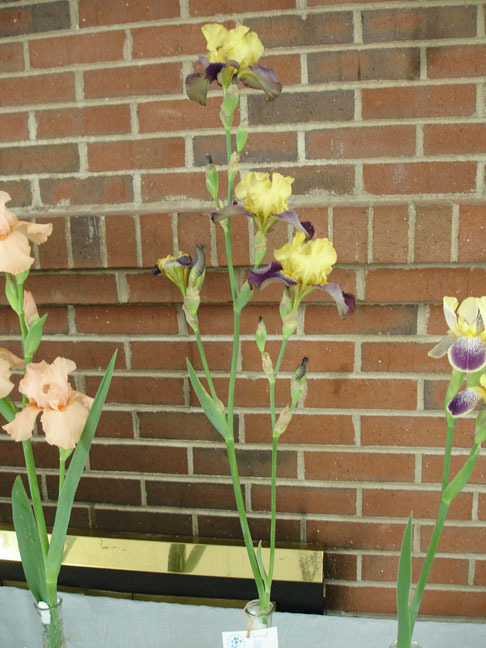 About six weeks following spring bloom, the non-rebloomers go dormant for the summer. In drought conditions they will even lose their fans until the cooling days of fall. 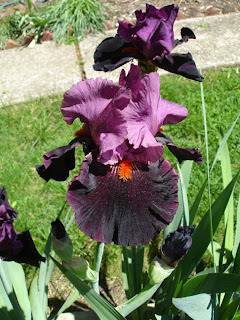 Forcing once-blooming irises to continue growing can, and will, lead many to soft rot in the hot days of summer. The care of rebloomers needs to be considered when deciding how many you need to grow. 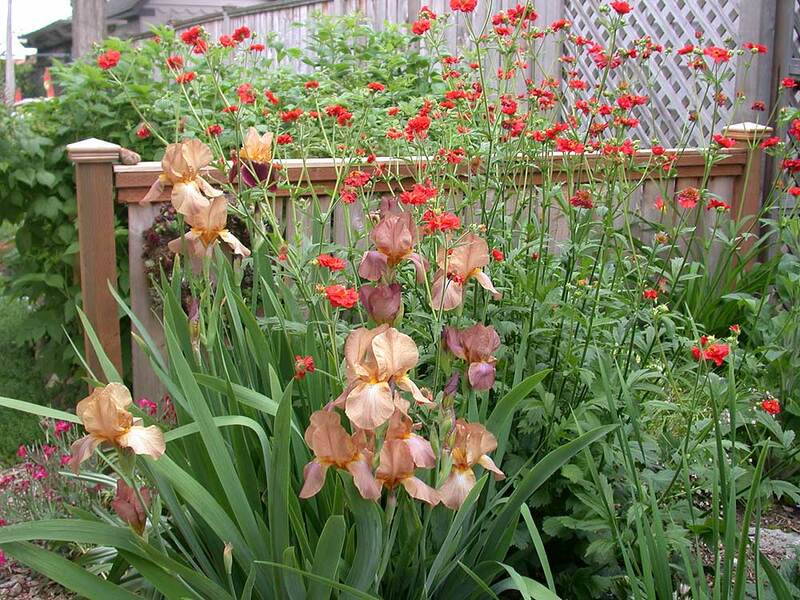 Rebloomers require faster increase, and more strength to supply the double bloom season. This often creates a faster increase of clump size. Existing advice is to grow two clumps of each iris, digging them on alternate years, so that you always have one mature clump. 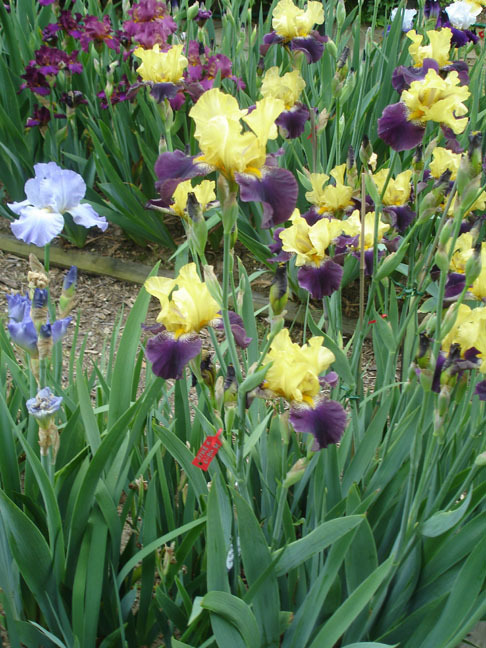 In tighter circumstances, you could plant just one clump and dig alternate sides each year. 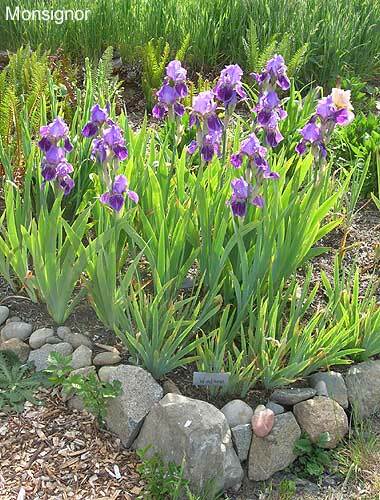 Irises need a minimum of approximately 6 hours of sunshine per day. Although winters can get below zero in my zone 6 garden, summers can be brutal. Any blooms in the summer or early fall will be greatly enhanced if some shade is provided. When you don’t have space available on the east side of a building, planting tall flowers down one side of the bed can provide shade. Get creative! 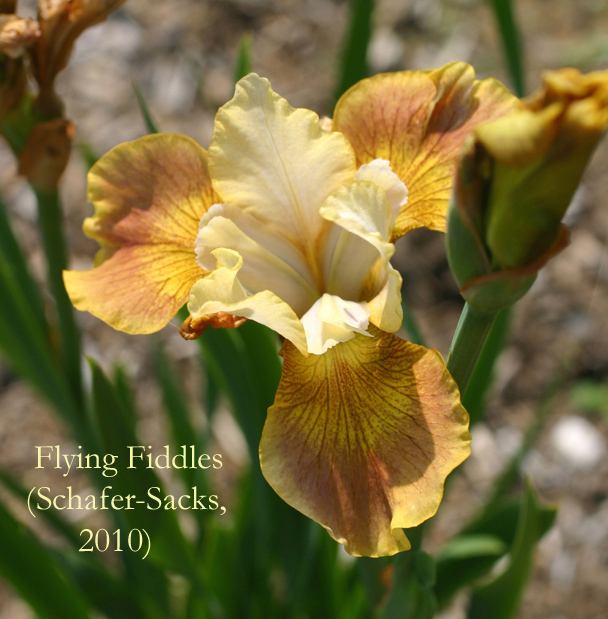 If this isn’t possible, know that non-shaded temperatures above 90-degrees tend to reduce any open blooms to the consistency of wet tissue; later blooms will be fine. 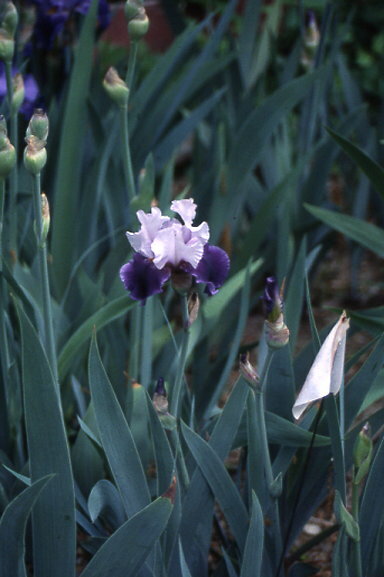 Spring blooming irises go dormant about six weeks after bloom season -- this is normal. 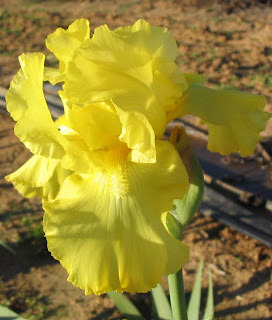 If rebloomers go dormant they do not produce rebloom, so it is necessary to continue growth. Fertilize after the spring bloom season has ended. Water approximately every ten days. Supplement when Mother Nature is not on the job, but never water when the temperature reaches 90 degrees and above. It’s best to water early in the morning. Wet foliage may cause rot, so soaker hoses are a good option. Once you determine the size and location of your new planting, it’s time to choose the reblooming irises. If you choose zone 8 or 9 rebloomers for a zone 5 or 6 garden you are sure to suffer disappointment! This is why iris research becomes very important. In the spring you can visit gardens in your region. Many clubs maintain a display garden. This is a mission, so carry a notebook. 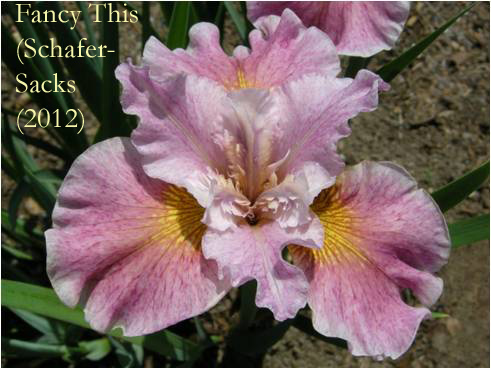 All rebloomers do not bloom in all gardens. 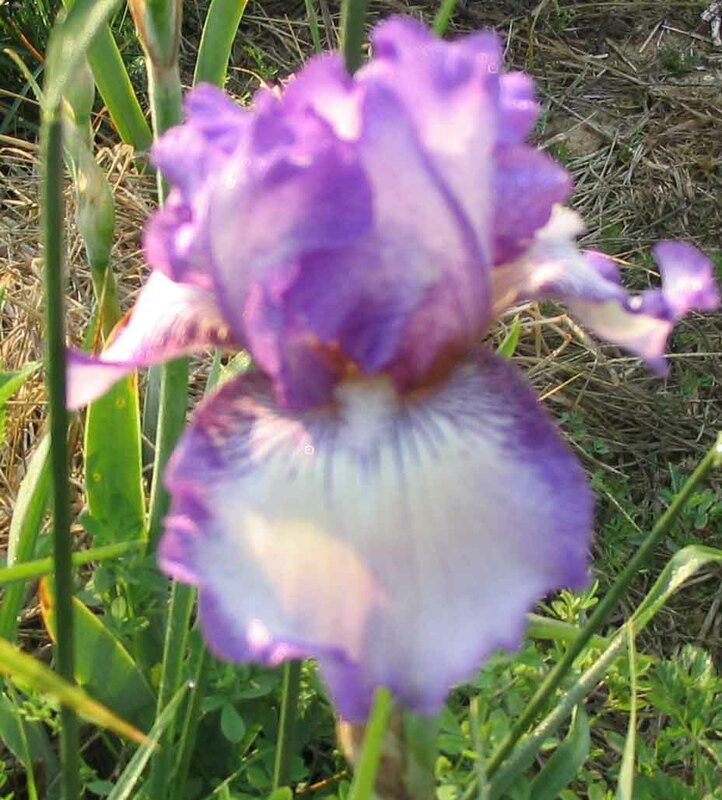 Even those that are reported to rebloom in your area may not be happy in your garden. 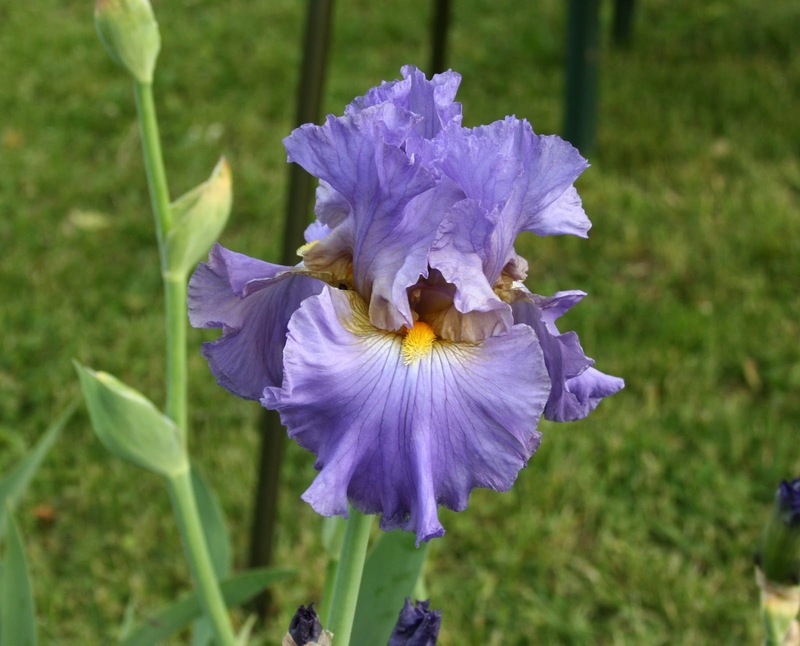 It’s advisable to quiz established iris growers in your general area to determine the irises most likely to rebloom in your area. You can conduct research on the Internet. 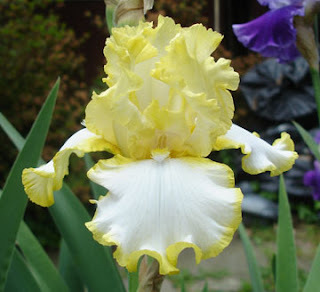 Many of the online gardens have information about rebloomers. Remember to pay attention to the zones they are reporting. The Reblooming Iris Society has a website. A membership in the RIS includes two issues of ‘The Recorder’ each year, which contain rebloom reports from most regions. Reports of rebloom are compiled in a cumulative checklist, available though the RIS website. 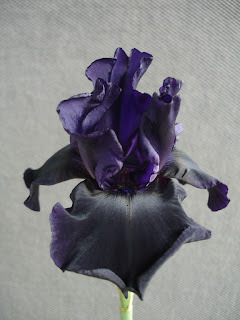 You can find many discussions on rebloom in the archives of both iris-talk and iris-photos. 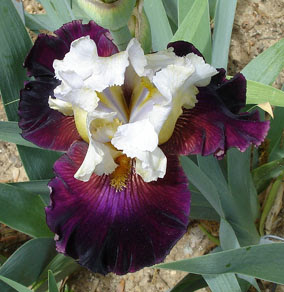 Many things iris can be located at the website of The American Iris Society. Of all the many color tones the 'rainbow flower' displays none is so odd, to my mind at least, as the multitude of shades of brown. Brown is not a color normally associated with blooms, unless they are decaying, bringing to mind dull, drab and muddy colors, but when we head out to the iris garden we find just the opposite - a glittering array of metallic tones from light buff thru rust and oxblood to deepest molasses brown, verging on black. One of the first popular brown irises and one of the best is this week's iris classic: 'Jean Cayeux'. 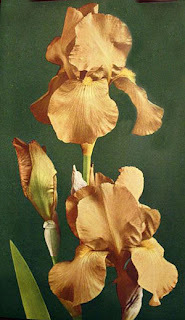 'Jean Cayeux' (pronounced Zjahn Ky-yuh) was first introduced by the French firm of Cayeux et LeClerc in 1931 it was immediately lauded as a fine new addition to the iris palette, thrilled the gardening world in Paris, and was awarded both a Certificate of Merit from the Société Nationale d'Horticulture de France as well as the the French Dykes Medal for 1931. "Without doubt one of the most outstanding introductions of recent years. It is an entirely new color. 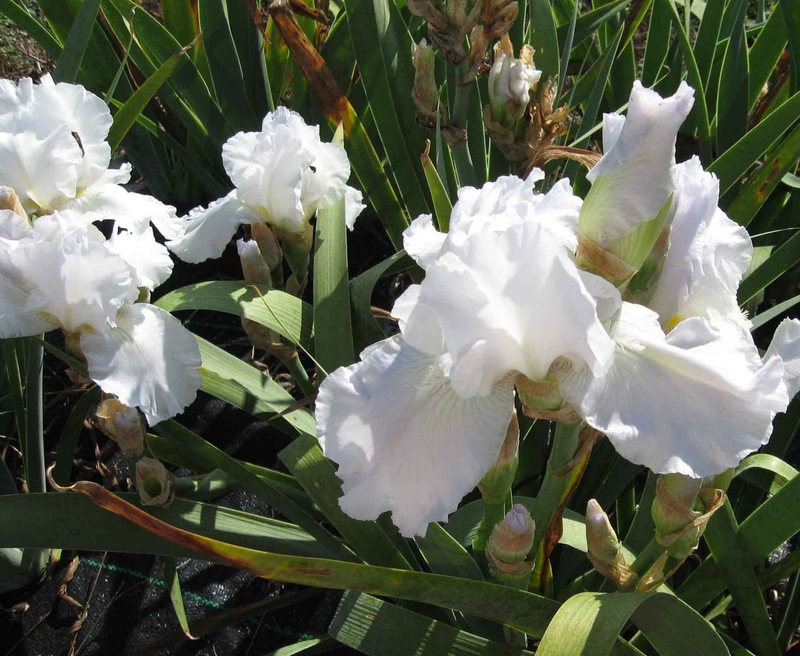 The flowers are well formed and slightly frilled, of pale Havana browns, hot with golden glint and a light touch of blue at the end of the beard brings out its delicate beauty. An enchanting new color." 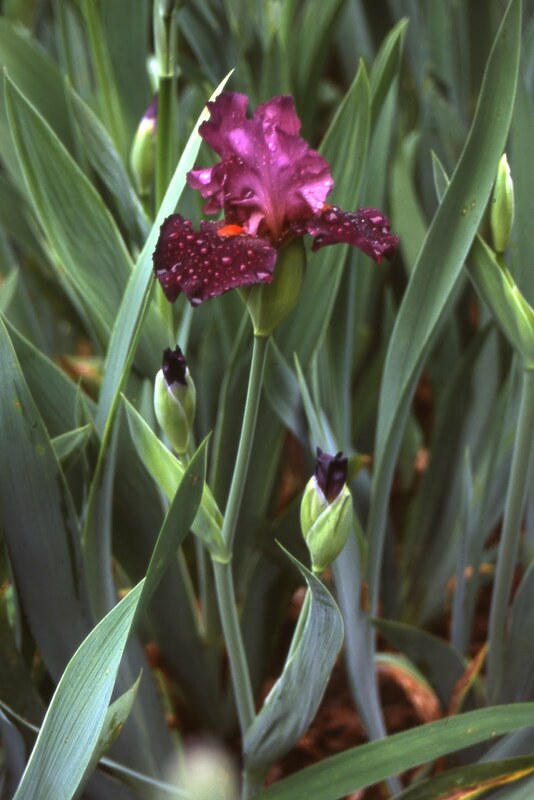 'Jean Cayeux' went on to acclaim across the iris world, and was to become an important parent in the history of iris development. 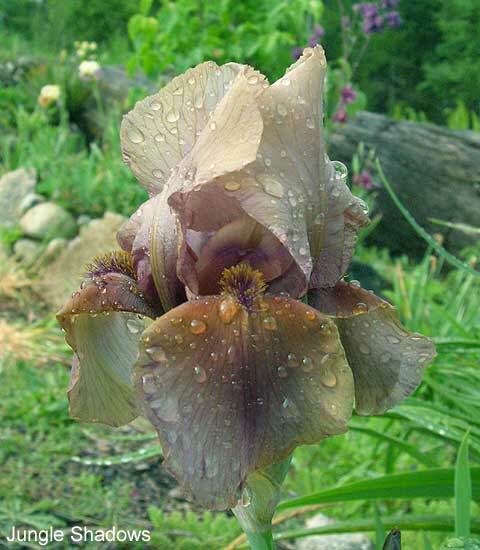 It was one of the main varieties that comprised the basis for the lines of brown irises developed by Dr. R.E. Kleinsorge, which themselves made history. Most especially with his first breakthru 'Far West' which went on to sire the famous 'Tobacco Road'. As you can well imagine 'Jean Cayeux' is a variety treasured by collectors of historic irises today. Above: 'Jean Cayeux' paired with bright red Geum and the golden yellow of Calendula. 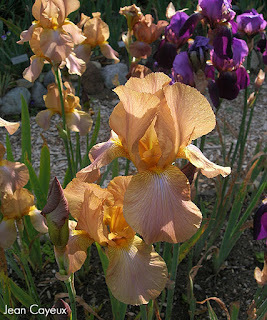 This variety is an easy doer in the garden. Hardy, reliable of bloom and with nice tall stalks and loads of flowers. It blends surprisingly well with strong colors. I love it with bright reds, gold and deep purples, and it looks equally as good with soft blues and creams. It has a diamond dusted finish giving it a metallic look, and the color tones adjust thru the day with the available light, sometimes a soft smoky buff, others a gleaming old gold infused with pinkish tones. It is especially beautiful with the golden light before sunset streaming thru it. 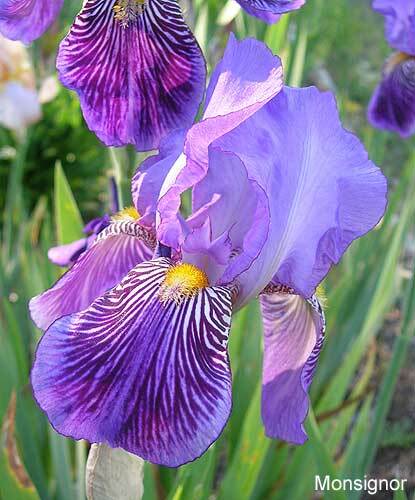 Those who admire the old fashioned form of classic 1930's irises will love 'Jean Cayeux'. 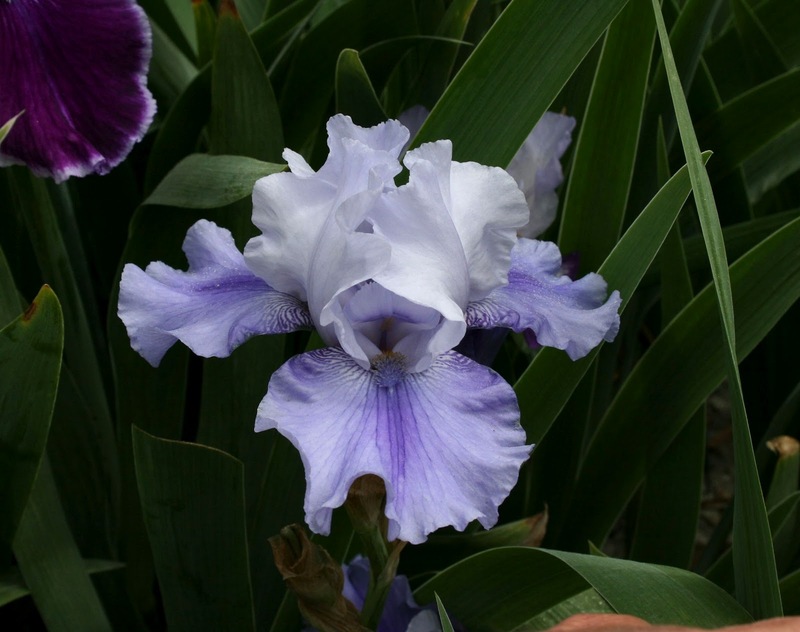 It has proven itself over and again on the anvil of the decades to have a timeless beauty, an enduring appeal, and to be a true iris classic.